There are quite a few minute muffler businesses in the United States. Undoubtedly, with so many people driving their own cars, it makes a lot of sense to get into the minute muffler business. But, how profitable can the business be? Will you be able to make money? And what services can you provide? Let’s take a look at some of these successful muffler businesses and find where the real opportunity lies for a new business owner. First off, the name minute muffler could be a little misleading. I doubt anyone can actually change a muffler in just one minute. But, great company names evoke an emotion. This is a good brand name for a speedy service car business, but it would not be a good name for a pest control company. Even though the name has muffler in it, that does not mean you only have to service mufflers for your business. There are plenty of opportunities to add on related services. After all, the car services business is a huge industry! Dublin, CA is the home of minute muffler, a muffler business that was started back in 1976. If I had to pick, this would be the king of the muffler franchise business. As you can imagine, any business that has been running that long has definitely found a good customer base. That means, if there is no top quality muffler company in your area, you could be filling a huge demand. They service complete muffler systems and catalytic converter systems too. But, you do not have to stop there. Another minute muffler business is located in Oakland, CA. Although the two are not related, they actually do muffler repairs and brake repairs. Now, that’s a great service to complement the core muffler business. While servicing one customer, they will be more likely to come back to you for more work. This way, you can expand your car service offerings to make great use of the winning wholesale formula used by these auto repair franchises. To start your own minute muffler business, you will either want to train yourself to be a mechanic or hire other mechanics to work for you. With pricing for services between $200 and above, it is possible to make a healthy profit by providing A+ service. Of course, people will always return to quality services even if you are a little more expensive than the competition. And if you live up to your name and provide a quick turnaround, most people will be really happy to have their cars back sooner. The quicker they get their cars back, the faster the payments are collected, making your muffler business a huge success. Before opening your own muffler shop, you should pursue an ASE certification, or Automotive Service Excellence certification. Getting an ASE certification will help enhance your business credibility within the auto repairs industry. It will also provide you with the training you need to help your small business muffler shop succeed. ASE certifications are entirely optional, just like getting an accounting degree. However, they are sure to help improve business performance and sustainability. It will provide an image of legitimacy, credibility and trustworthiness to potential customers. Keep this in mind if you decide not to open a muffler shop franchise in favor of starting your own auto repairs business. Another muffler shop franchise you may want to consider is Midas. Midas offers worldwide name recognition, which is hugely important to franchise success. Depending on what type of automotive franchise you want to open, Midas can be an even better choice than Minute Muffler. In addition to muffler repairs, you can also perform many other car service procedures when you own a Midas repair shop. 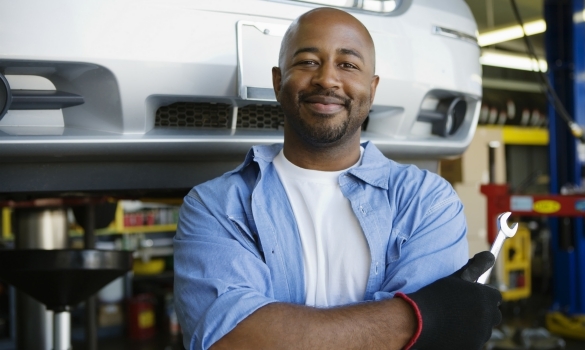 Owning a car repair franchise like Midas offers you the opportunity to open your own auto shop with help and guidance from people that know the business inside and out. If you want to open your own car repair service business that allows you to do more than just fix mufflers, consider a Midas franchise.